Concluding a 60-day stay at the International Space Station, a Japanese robotic cargo freighter left the complex Monday and headed for a destructive re-entry over the Pacific Ocean later this week. Covered in bright orange thermal blankets and deep blue solar panels, the H-2 Transfer Vehicle, nicknamed Kounotori 2, was released from the space station's robot arm at 1546 GMT (11:46 a.m. EDT). The space station crew issued a retreat command a few minutes later for the HTV to fly away from the space station. Two separation engine burns guided the ship on a safe trajectory departing the complex. "We've had Kounotori on the station after a successful capture for about two months now," said Cady Coleman, the robotic arm operator during the HTV capture and departure procedures. "It brought an amazing amount of supplies that were very much needed here on the space station and was also important in (taking) away some of our packing material and things we just can't afford to have on the space station anymore." Coleman and Italian flight engineer Paolo Nespoli grappled the HTV with the lab's robot arm at 0811 GMT (4:11 a.m. EDT) and methodically pulled the 33-foot-long craft from the space station's Harmony module. Coleman and Nespoli were at the controls of the robot arm inside the seven-window cupola module. Once the crew maneuvered the HTV into the release position about 30 feet below the station, Japanse engineers in Tsukuba, a city about 30 miles northeast of central Tokyo, activated and checked the freighter's guidance, navigation and control systems. The Space Station Integration and Promotion Center in Tsukuba was damaged during the March 11 earthquake that ravaged Japan's northeast coast. 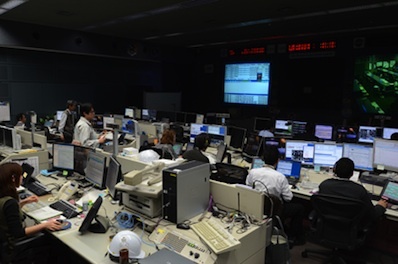 Control of the HTV and Japan's Kibo laboratory was temporarily handed over to NASA in Houston, but officials restored full commanding, telemetry and voice capabilities to Tsukuba March 21. The space station crew folded origami cranes to be placed inside the HTV as a show of support for Japan's recovery from the devastating earthquake and tsunami. Origami cranes were also visible at control consoles on the ground in Houston and in Tsukuba. "Today marks the end of a very productive time for the Japanese flight module Kounotori and the excellent demonstration of robotics in space," Coleman said after the HTV was released. The HTV delivered 8,500 pounds of experiments, spare parts and crew provisions to the space station after launching Jan. 22 from the Tanegashima Space Center in southern Japan. The 35,000-pound craft arrived at the complex five days later, and the lab's crew removed two external payloads with the station's robotics systems and transferred several tons more by hand from the HTV's pressurized cabin. Now filled with trash and packing foam from the shuttle Discovery's mission in early March, the HTV will dispose of the station's garbage in a fiery re-entry over the Pacific Ocean later this week. 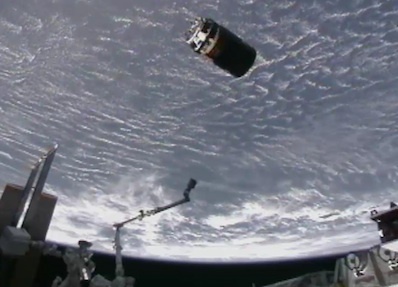 The HTV is slated to fire its engines at about 0237 GMT Wednesday (10:37 p.m. EDT Tuesday) and dive back into the atmosphere about a half-hour later. Officials expect most of the spacecraft will burn up, but any debris that reaches Earth's surface will fall in the unpopulated southern Pacific Ocean. The craft's pressurized cabin is loaded with trash and bulky foam packing material left over from the shuttle Discovery's visit in early March. The foam helped safeguard payloads inside the Permanent Multipurpose Module, a new storage room delivered by Discovery. In its external payload bay, the HTV delivered a spare flex hose rotary coupler for the space station's cooling system and a cargo transfer container holding fresh electrical circuit breakers and a video distribution unit. Astronauts and ground controllers robotically placed those payloads on storage locations oustide the orbiting lab. The crew manually unpacked science gear, spare parts and crew provisions from the HTV's pressurized section before replacing the supplies with trash and foam. 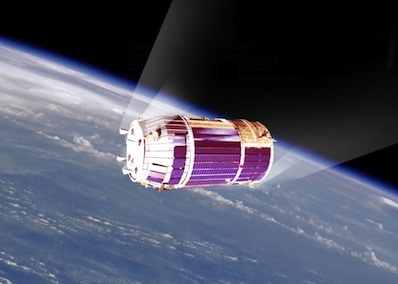 The next HTV mission is scheduled to launch from Japan with more supplies in January 2012.